Due to the lectionary being fairly unimpressive to me for the Sundays in late July, I took the liberty of switching some texts around and have been preaching on the story of David and Bathsheba this past Sunday and next. This has been an interesting text to prepare for, first of all because children are generally with us in worship during the summer months (we have "children's church" the rest of the year). Maybe it wasn't the best decision to pick this text for that reason, but it's too late now. So moving on. This past Sunday, I preached on 2 Samuel 11:1-15, which was actually designated for this coming Sunday. I was first struck by how genuinely horrifying David's actions are: he sleeps with the wife of one of his soldiers and, after several attempts to cover it up, has a message delivered to his commander Joab to have Uriah killed. And Uriah is the one who delivers it. This after Uriah refuses to go down to his house to be with Bathsheba because it's wartime and he believes that he should show solidarity with the other soldiers. So Uriah delivers his own death warrant for being loyal to the king. The second thing to be noted in this part of the story is the absence of God. God has no speaking or acting role, and certainly isn't consulted by David during this episode. God isn't even mentioned in passing; the "lord" references are all to David or Joab. This is a scene of purely human action and exposing some of humanity's worst tendencies, and God is ignored or left out. 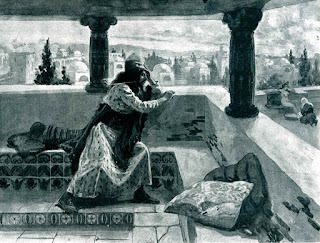 The second part of the story proposed by the lectionary is 2 Samuel 11:26-12:13a, where we are finally told that what David did "greatly displeased the LORD." And so the prophet Nathan approaches David and tells a story of a rich man with many sheep who takes a poor man's single sheep. David predictably gets upset and wants to know who this guy is, and Nathan responds, "It's you, you selfish, power-mongering @#$%&!" (can't you imagine Nathan saying something like that, or at least wanting to?). Having the mirror held up to him like that finally shifts something in David's soul, and he begins to repent and inquire how he can make things right. Unfortunately for him, God has already laid out a plan for that. Now, here's where I think God behaves horrifyingly. Anyone out there with major Calvinist or inerrantist leanings is going to take issue with this, but God decides to punish David by killing the child conceived during the course of his indiscretion. Being a father has made me more sensitive to this part of the story, I think: after David kills one innocent person to cover up his secret, God punishes him by killing a second innocent person. That makes no sense to me whatsoever. Not surprisingly, the lectionary's designated reading ends right before that happens, so I don't have to deal with it on this particular occasion, but for me the specter of that punishment hangs over the text regardless. I'm baptizing an adult this coming Sunday as well, so at least the story that Nathan tells will provide an ample tie-in to our seeing our true reflection in the baptismal waters and the transformational power that it holds. So that's what I'm thinking about this week.